Glass Insulators were first commercially mass produced in the late 1840s for use with batteries, telegraph lines, and lightning rod systems. As telegraph, telephone, fire alarm, railroad signal, high voltage transmission, and radio antenna system technologies developed, the need for insulators grew very quickly, and reached its peak sometime in the second decade of the 20th Century. In the 1920s our systems moved electricity and electronic signals over open steel and copper wire. Today's technology moves electronic signals and electric power from point to point in ways that require different insulation techniques. Advanced composite materials, ceramic compounds, plastic conduit, glass fiber, microwave, and nano-wave broadcast have all conspired to render the glass insulator of yore obsolete. Pioneering collectors tell stories of finding and swapping old insulators as early as 1935. However, there is no evidence that these collectors had formed an organized hobby until decades later. Insulator collecting as a formal, organized hobby actually began to emerge on the national antiques and collectibles scene in the middle 1960s. In January, 1970, Old Bottle Magazine (OBX) ran an article announcing that the first big insulator swap meet would be held on June 20th and 21st, in New Castle, Indiana. In August, 1970, Dora Harned, editor of Insulators magazine, reported on that show. In September, 1970, OBX also ran a short article, written by Bob Pierce, on the New Castle, Indiana, swap meet. Then, in October, 1970, OBX ran another article, written by Dennis Donovan, which more completely covered the event. In the May and June, 1967, issues of The Western Collector magazine, Claire T. McClellan wrote The Insulator Story in two parts which may be the first printed examples of insulator collecting to have been chronicled in any hobby journal. In March, 1969, Insulators magazine published its first issue. Since that time Insulators - Crown Jewels of the Wire has been the preeminent hobby journal. Over the intervening decades it has had three very capable owners and has become known as Crown Jewels of the Wire. Also during that time, insulator related publications including Cross Arms, Rainbow Riders Trading Post, Power Line Explorer Journal, and other miscellaneous periodicals serve or have served the hobby. The Insulator Society of America (ISA) made the first published attempt to encourage insulator hobbyists into national membership in the early 70s when one of its members wrote to OBX. That issue also contained information about the National Association of Insulator Collectors. Many such attempts to nationally unify insulator collectors were being made during the period. 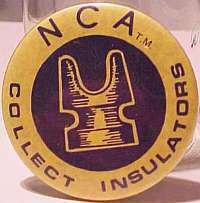 The dust began to settle when the National Insulator Association (NIA) was founded on July 7th, 1973, with the election of its officers at the fourth big insulator show in Kansas. The earliest official announcement from the NIA's elected officers can be seen in the September, 1973 issue of Insulators magazine. The NIA exists today as an all volunteer, international, nonprofit, educational, and scientific organization with a registered membership of thousands and an active membership numbering in the hundreds. It is one of many North American organizations interested in preserving and conserving the history and beauty of telecommunication and electrical service distribution insulators. Insulator enthusiasts and their organizations can be found on almost every continent. Hobbyists in Germany, Great Britain, Australia, Russia, New Zealand, Poland, Hungary, Holland, Colombia, Thailand, and The Netherlands participate in trades, sales, auctions, e-mail lists, and club memberships world wide. The European Insulator Association (EIA) held its first annual meeting in Pisa, Italy, on June 8th, 2003. This site is dedicated to the dreams and pursuits of all insulator collectors everywhere.